If you’re planning to live or work in Australia for between three months and four years, you must obtain a temporary residence visa. Applications are made using form 147 Application for a temporary residence visa (non-business). Applicants may be required to have a medical examination and chest X-ray before a visa is granted, although this isn’t usual when the intended stay is 12 months or less. Some types of temporary residence visa require a fee. Applicants are expected to stay for the full period of their planned stay. In most cases, temporary residents are granted a multiple entry visa for the period of their approved stay. Temporary visa holders have no access to social welfare benefits or national public health cover while they're in Australia. Certain categories of skilled worker and professional are permitted to enter Australia for a fixed period (e.g. the duration of a contract) of up to four years to take up employment where it can be shown that a job cannot be filled by a resident. There are no set quotas for visas for most temporary workers, who may be engaged in a wide range of occupations, including academic staff; domestic staff; entertainers; executive, professional and technical people; foreign government officials; media and film staff; medical practitioners; occupational trainees; religious personnel; retirees; sportsmen/women; and working holidaymakers. The required skills are shown to be unavailable in Australia. The pay and conditions aren’t less than the normal pay and conditions for such a job in Australia. The employment of a temporary resident isn’t a substitute for training Australian or permanent residents for such a position. The position isn’t for an unskilled or semi-skilled job. The normal health and character requirements are met. If you receive a temporary residence visa permitting you to work in Australia and your spouse is named on the application as your dependant, he or she is also permitted to work in Australia. A temporary residence visa isn’t automatically renewable and no change of job or sponsor is allowed after entry into Australia. Anyone in Australia for less than six months must have private health insurance unless their country of citizenship has a reciprocal health agreement with Australia. Information about non-business temporary residence visas is provided in Temporary residence in Australia non-business – general guide (form 986i). Applications are made using form 147 Application for a Temporary Residence Visa (non-business). Applicants may be required to have a medical examination and chest X-ray before a visa is granted, although this isn’t usual when the intended stay is 12 months or less. 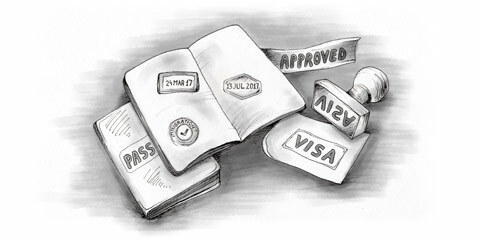 Some types of temporary residence visa require a fee and most require sponsorship. Applicants are expected to stay for the full period of their planned stay. In most cases, temporary residents are granted a multiple entry visa for the period of their approved stay. Temporary visa holders have no access to social welfare benefits or national public health cover while they’re in Australia. Many temporary residents must be sponsored (or require a nomination, written invitation or a sponsor’s undertaking to support an application), e.g. by a prospective employer or organisation, as shown in the table below, which also indicates whether a sponsorship fee is payable. Temporary workers seeking to work in Australia for longer than four months must be sponsored by their prospective employer. The sponsor must lodge a Sponsorship for Entry to Australia for Temporary Residents form. Sponsoring employers must have a satisfactory record of training staff and show that there’s no resident person available with the required skills. The sponsor must be willing to accept financial and legal responsibility for the temporary resident and is also responsible for his welfare and accommodation. If the sponsor is an employer, any salary paid must be guaranteed and must fall within the industry pay awards for the job.